Turn your Outlook into professional CRM software. Work with the well-known environment, stay in one application and don't switch between. Integrate Emails, Calendar, Tasks and Contacts. 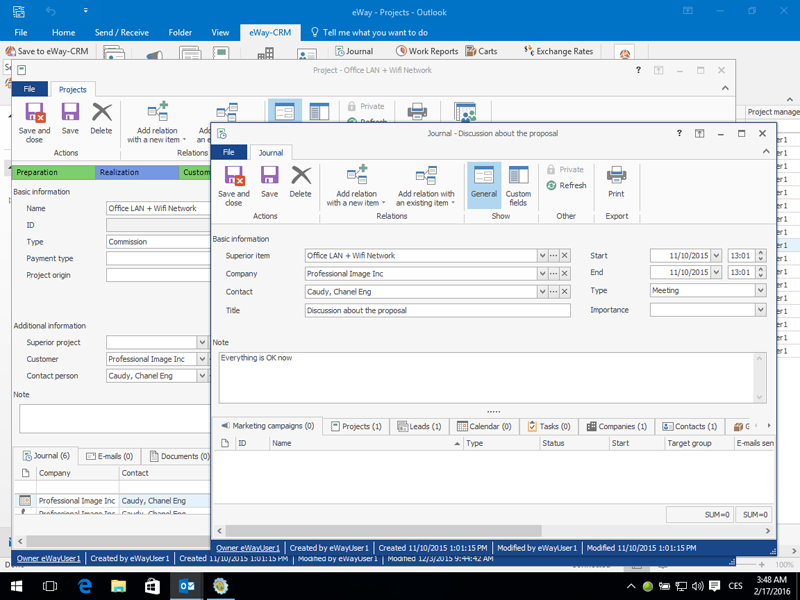 Get your staff familiar with CRM, looks exactly like Microsoft Outlook. Give users a tool they already know and decrease your training costs. Contacts, Sales, Projects and Marketing Mail Merges available from your Outlook. Get the full communication history, attach documents, plan follow-ups, send bulk emails. Manage your pipeline, monitor life projects and let eWay-CRM send you reminders when needed. Share your Outlook with other team members. Emails, Calendar, Contacts or Tasks. All saved data is instantly available for everyone's access. Our CRM software also has an auto-tracking feature. When enabled, all your incoming and outgoing emails are automatically saved to eWay-CRM and organized by contacts / projects. Customize eWay-CRM to your needs. Create grid reports, utilize advanced filter editor, save user views for later use. Statement: First, please download the orginal installation package by clicking the download link. Of course you may also download it from the publisher's website. Using eWay-CRM crack, key, patch, serial number, registration code, keygen is illegal. The download file hosted at publisher website. We do not provide any download link points to Rapidshare, Hotfile, Depositfiles, Mediafire, Filefactory, etc. or obtained from file sharing programs such as Limewire, Kazaa, Imesh, Ares, BearShare, BitTorrent, WinMX etc. Software piracy is theft. If you like eWay-CRM please buy it.